With the Winter Olympics upon us I thought it timely to remember Golden’s Winter Olympian, JJ Thomas. After capturing the bronze medal in the half pipe snowboard competition in Salt Lake City, JJ returned home to Golden, CO, in true champion style. It all started with the Golden City Council proclaiming March 9, 2002 as JJ Thomas Day in Golden. Then, the City of Golden planned an all-out welcome home celebration that began with an autograph signing party, followed by a downtown parade, fireworks, a medal ceremony, and a closing post-party that was all open to the public. Finally, Washington Avenue was temporarily renamed JJ Thomas Boulevard for weekend homecoming celebrations, March 9-10, 2002. Kind of makes you want to go out and win a medal for your hometown. Fortunately, a reminder from this special celebration was tucked away for safe-keeping in the museum. The autographed street sign used to rename Washington Avenue JJ Thomas Blvd. is now on display at the history center. My attempts to connect with JJ have not been successful yet-I hope to talk with him and at least collect a few photographs of him in his element. 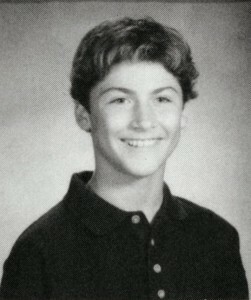 Until then this is JJ’s freshman picture from the 1996 Golden High School yearbook. Go USA and Go Golden!